Welcome to this addition of PaleoNews! A new large, predatory lizard has been described from the Late Cretaceous of South Korea. Asprosaurus bibongriensis is the name of this new taxon. This animal is especially interesting as it is South Korea’s first Mesozoic lizard. Asprosaurus belongs to a possibly polyphyletic clade of varanoid lizards known as the Monstersauria. The famous Late Cretaceous Djadochta lizard that took over Citipati and Oviraptor’s egg stealing habits, Estesia, was also a member of this group. 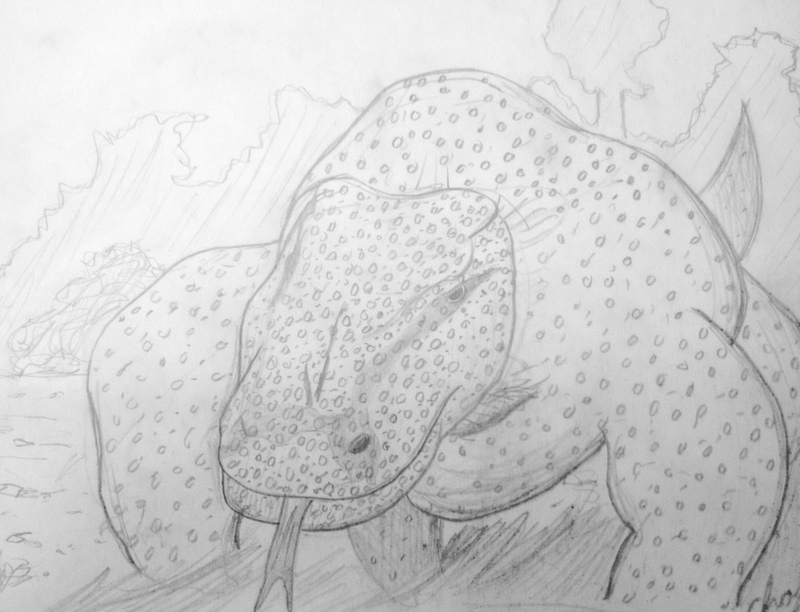 Asprosaurus was larger than Estesia and may have gone after bigger things then dinosaur eggs. There is speculation that, like other large Mesozoic non-dinosaurian animals, Asprosaurus may have fed on dinosaurs. Koreanosaurus boseongensis and fossil dinosaur eggs have been found alongside Asprosaurus in the Seonso Conglomerate Formation. Asprosaurus bibongriensis by the author. Pencils on paper, 2015. 10 new rodents from the Oligocene of Oregon have been identified. The Oligocene deposits of Oregon are already known for their large mammals. These new rodents are especially important as they help us piece together the entirety of that ancient ecosystem. At his blog, Mark Witton shares with us his wonderful artworks of the Wealden Supergroup’s biota. His work is absolutely breathtaking and I suggest you hop over there and check his illustrations out! 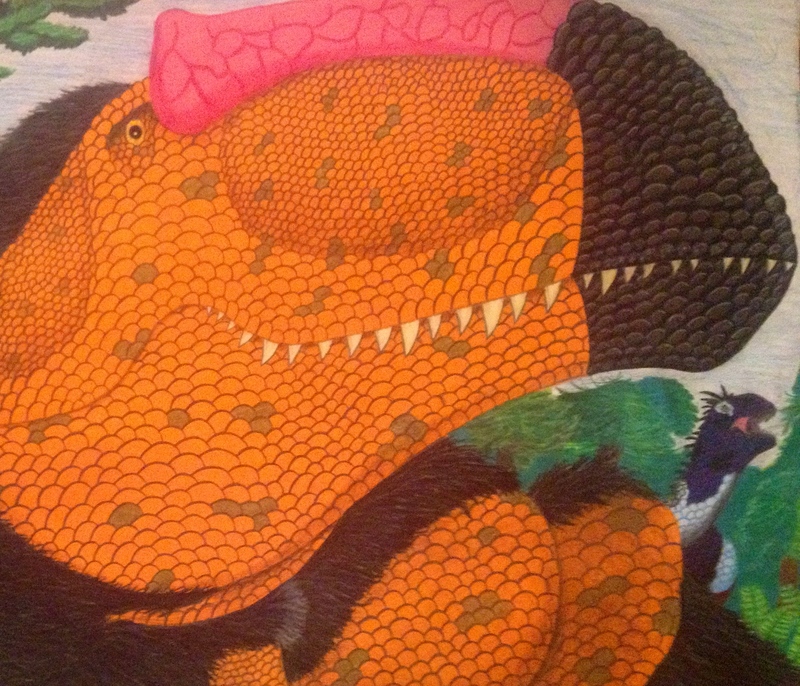 At LITC, another installment of Vintage Dinosaur Art is out, and this time the book Prehistoric Life is reviewed. It’s always a blast to read the LITC guys’ book reviews, so I definitely recommend reading this new edition! At SVPOW!, Mike talks about “mega-journals” and their limits, and of possible brachiosaurid skull remains. The first post mentioned is very interesting and I suggest you go read it here! The second post, another great read, can be found here. At dinosaurpalaeo, Heinrich tells us all about his new, crazy cool mass digitization project, and also of food snatching among avian dinosaurs. You can find those posts here and here. 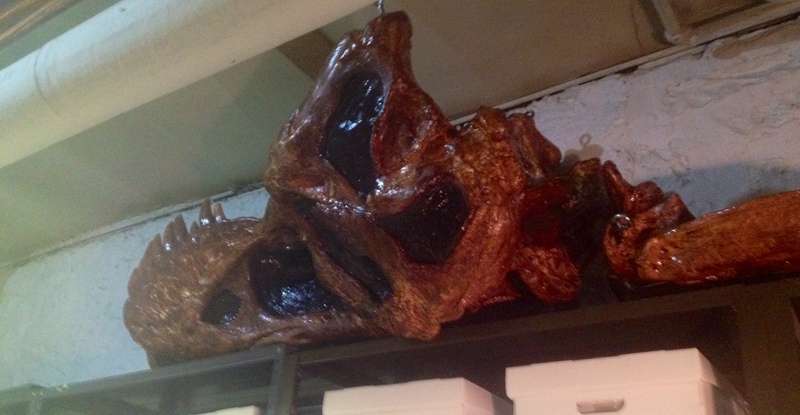 Anyone else excited for T. rex Autopsy? I sure am! This new National Geographic special will show the dissection of a Tyrannosaurus rex! Check out John Hutchinson’s post here for more information. 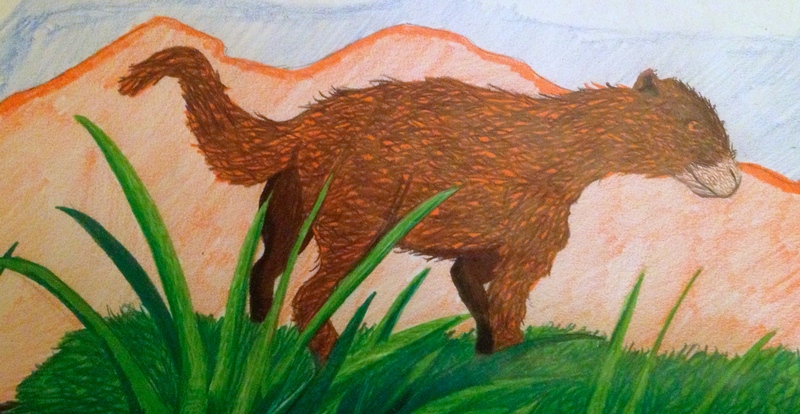 Twilight Beasts has a fascinating post on prehistoric canids, which you can check out here. They do a really great job over there with prehistoric mammals and are very worth following if you have a wordpress account. As always, if you would like to feature your artwork on here, please contact me in the comments below. Thanks for reading PaleoNews #13, and I hope you enjoyed! As some of you may know, the Dinotopia exhibition that had been on display for the past few months closed on May 25th. 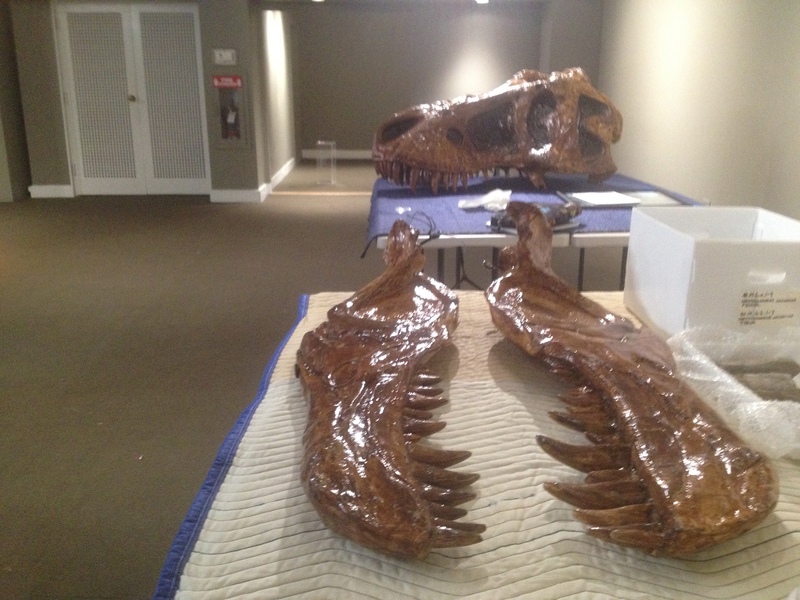 Our awesome museum volunteers and staff handled the paintings, leaving the fossils. Getting the fossils down to the collections room safely fell to a team that included myself. However, there was one item that required a bit more effort. Mr T. is a cast of the skull of AMNH 5027 (a T. rex specimen), and although the cast isn’t as heavy as the real fossil, it’s still a task to carry the thing down a flight of steep, short stairs and through a doorway without breaking anything. Mr. T’s upper half. Photo by the author, 2015. Two of our amazing volunteers brought the skull proper, and the rest of us were left with the lower jaw, which can easily be disassembled into two pieces. 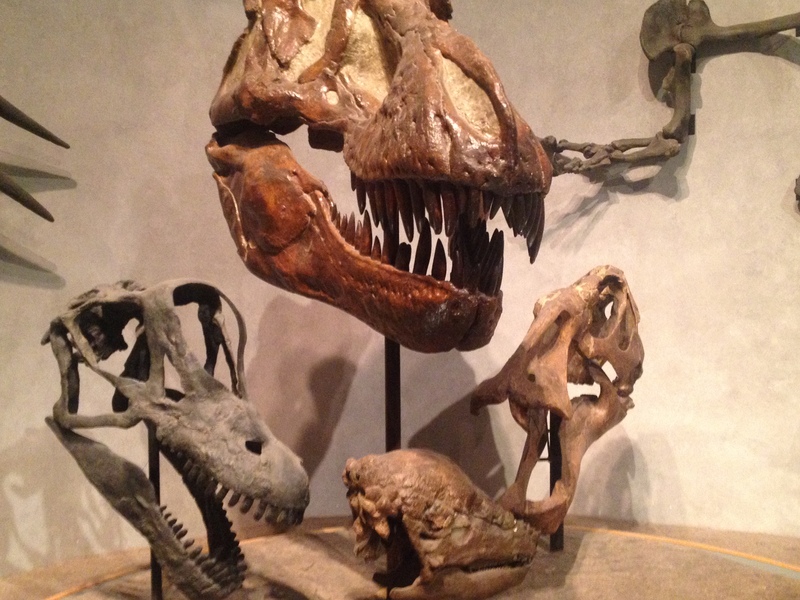 Mr. T. is a terrific cast of AMNH 5027 and really shows the skeletal anatomy of Tyrannosaurus’s skull in detail. Mr. T’s lower jaw disassembled. His head is in the distance. Photo by the author, 2015. After we arrived in the collections room, our space issue became even more apparent. After a long debate on where the skull should go, a shelf top was chosen. We still have to tie it to the wall (which we’re planning to do tomorrow), but it’s in a safe place and will be completely A-OK, so never fear! Thar He Lies! Don’t worry, there’s foam under the skull. Photo by the author, 2015. We also have this really nice cast of one of Mr. T’s teeth. Check it out! What big teeth you have! Photo by the author, 2015. Mr. T was the last to go back into the collections room, but don’t worry, as we have a whole lot planned for our fossil collection in the future. It’s evening, and a number of pycnodont fish called Anomaeodus phaseolus swim above a coral reef in the cold, murky coastal waters of the newly formed Atlantic Ocean. They gracefully zip through the salty water, feasting on any morsel of edible material they can find. But there are bigger, stranger fish in this sea. Behind a cluster of corals, a silent predator patrols the water, scanning for any signs of movement. Enter Scapanorhynchus texanus. The shark darts from the coral and snares one of the Anomaeodus in its jaws. For the fish, death is certain, and for the shark, it’s just another successful hunt. Scapanorhychus was a prehistoric goblin shark, and an extremely widespread one at that. The largest species, S. texanus, was a common sight in the Atlantic Ocean during the Late Cretaceous. Fossil teeth and other possible remains of this shark species are found along Eastern US Seaboard, including in the states of New Jersey (Phillips et. al., 2001) and North Carolina (Case, 1979). The teeth of S. texanus are the largest among all Scapanorhynchus species. When we scale S. texanus by comparing known S. texanus remains with those of the modern goblin shark, we find that S. texanus was around 11 feet in length. 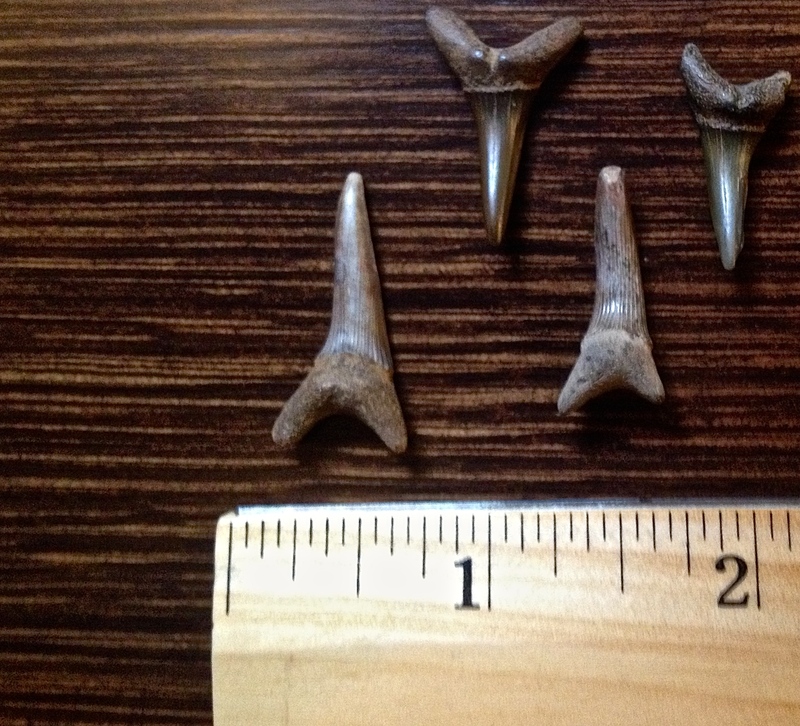 Scapanorhynchus texanus teeth collected Ramanessin Brook, NJ. Photo by the author, 2015. The fossilized anterior teeth of this shark have an elongated main cusp with bilateral roots, perfect for snagging slippery prey. The lateral teeth of the shark are more triangular in shape then the anterior teeth and are far broader. The fossilized remains of this mitsukurinid shark are found in coastal deposits (Phillips et. al., 2001), suggesting that this animal occupied the niche of a coastal predator. This is a far different niche from modern goblin sharks, which prefer the ocean depths as their hunting ground. Well-preserved body fossils of some species of Scapanorhynchus show that this taxon also possessed the long, pointed snout and long tail of modern goblin sharks. Scapanorhynchus texanus lateral tooth collected at Ramanessin Brook, NJ. Photo by the author, 2015. 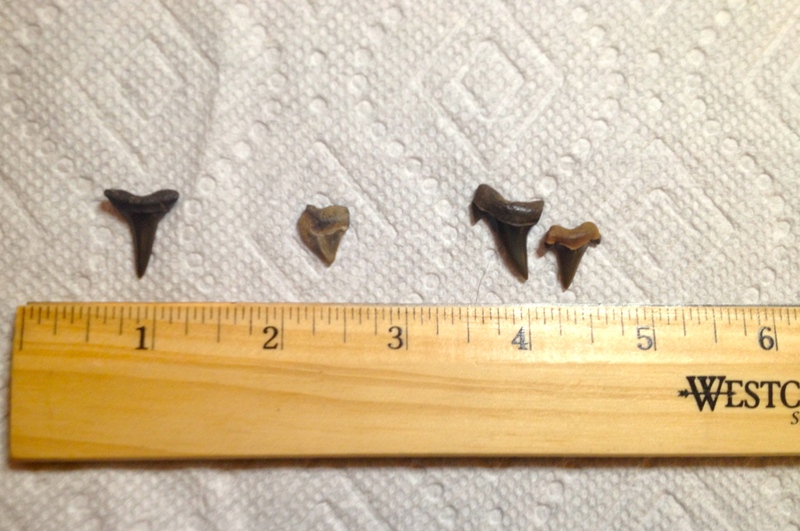 The teeth shown above came from “scaps” that called the coastal plain of New Jersey home. This ecosystem was home to a variety of other large predators, including mosasaurs such as Halisaurus platyspondylus (Wright, 1988). The teeth of other sharks which Scapanorhynchus texanus coexisted with in the Late Cretaceous Atlantic. From left to right: Paranomotodon angustidens, Squalicorax kaupi, Archaeolamna kopingensis kopingensis. Photo by the author, 2015. Teeth from other Scapanorhynchus species are also found in the Middle East (Retzler et. 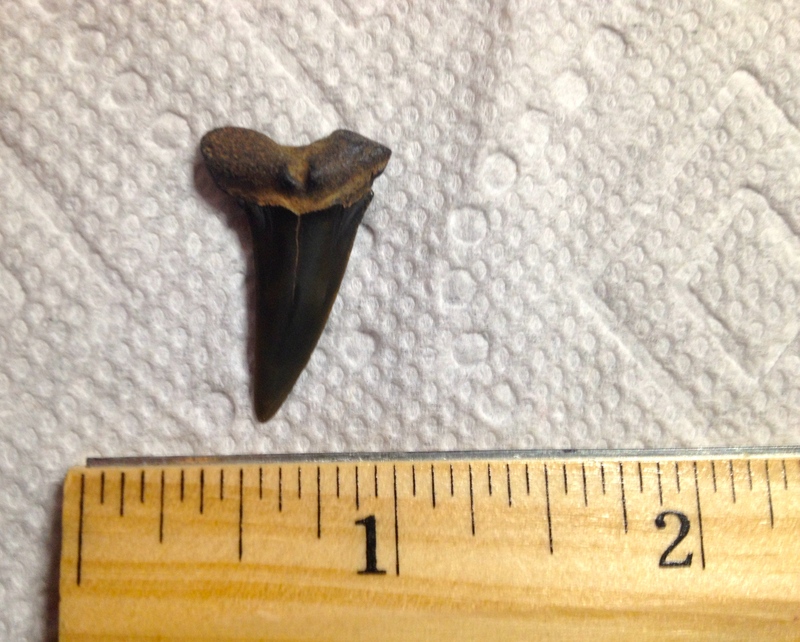 al., 2013), showing that this shark was present on both sides of the Atlantic Ocean. S. texanus was thriving during the Campanian and Maastrichtian stages of the Cretaceous, but this shark’s success was short-lived. Many species of Scapanorhynchus, as indicated by the fossil record, greatly declined in number following the KT extinction. 1. Phillips D., Rose E., Pedersen J. 2001. Big Brook Upper Cretaceous Geology and Paleontology. 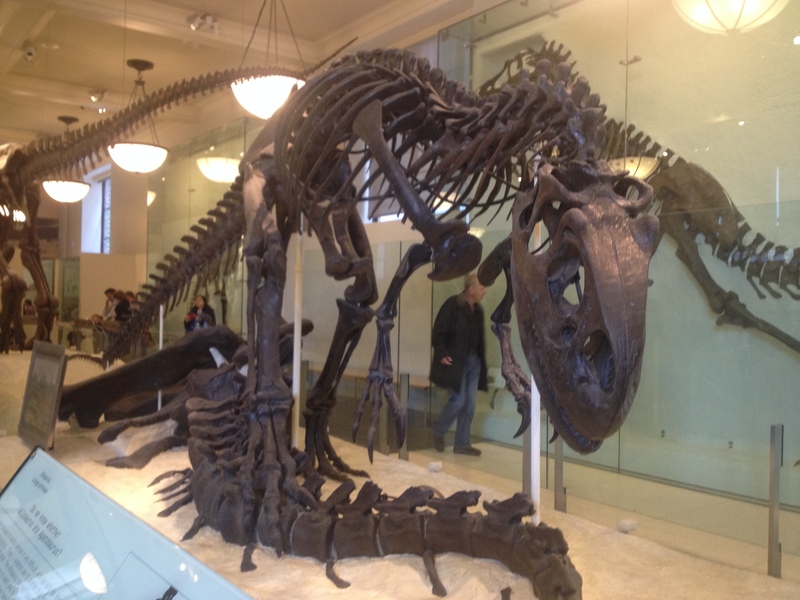 127 W 83rd Street, New York, NY: The New York Paleontological Society. 3. Wright KR. 1988. “A new specimen of Halisaurus platyspondylus (Squamata: Mosasauridae) from the Navesink Formation (Maastrichtian) of New Jersey.” Journal of Vertebrate Paleontology 8 (Supplement 3): 29A-30A. 4. Retzler A., Wilson M.A., Avni Y. .2013. “Chondrichthyans from the Menuha Formation (Late Cretaceous: Santonian–Early Campanian) of the Makhtesh Ramon region, southern Israel”. Cretaceous Research 40: 81–89. Hi everyone! Just a quick update. I have been able to change the blog title and theme ahead of schedule. We will most likely have Antediluvian Beasts of The East #1 sometime this weekend. If you are wondering, this will be the replacement to Stunning Strata, which didn’t fare very well as a series. I hope you enjoy the new look and stay tuned for Terrific Tetanurae! #9 on Friday. Have a suggestion for the style of this blog? Leave a comment down below telling me what you think! As always, thanks for reading! Oh summer! A time of opportunity! This summer, I am pleased to announce that The Tetanurae Guy will be going through a few changes. For starters, I am planning to have a new blog design up soon, and I may even create an official logo. I might also change the blog’s title and catchphrase. A bunch of new series will be up as well. The Whole Denver Museum gang is ready for the occasion! Get ready for trip reports! This series will show how fossils are collected, recorded, and placed in a museum collection. Hopefully, it will give the non-paleontologist/fossil collector readers of this blog a chance to see what it’s like to hunt for fossils. The first episode will probably be on Ramanessin Brook, a site in New Jersey. I am looking forward to sharing my experiences on the job! I also may be able to get interviews with some paleontologists, paleoartists, geologists, etc., which will definitely be a fun addition. Terrific Tetanurae will continue, and I am in the process of planning several new articles. This summer the theme is bizarre features, so we will be looking at the truly weird animals of the tetanuran family yee (see what I did there?). 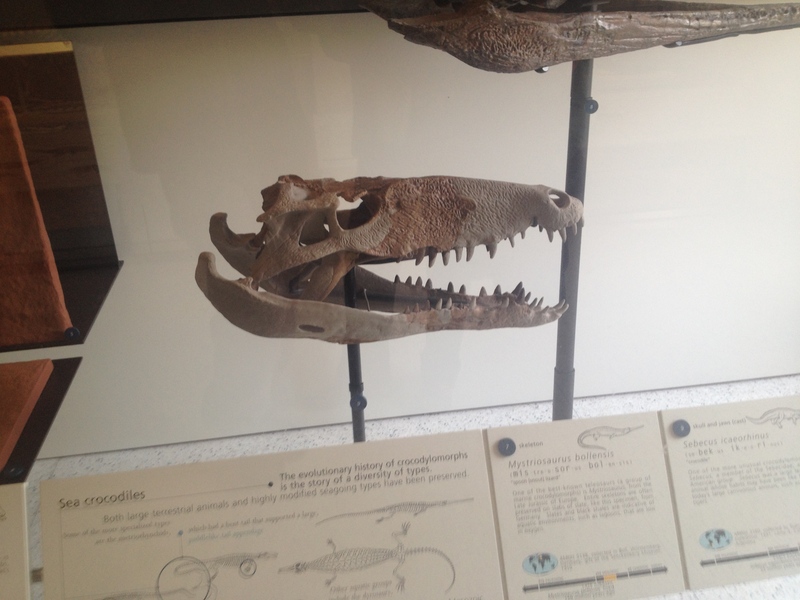 Sebecus is showing a smile at the AMNH! I am a little worried, however, about PaleoNews. My highest viewed series is hard to maintain, and I end up talking so little about animals which are so amazing. This summer, I think I am going to stop making this series weekly so that I can really focus on the importance of the taxa I discuss. PaleoNews won’t go away, but it will become better and more informative. The new series I am most excited about relates to my job. My research focuses on the natural history of New England and the east coast as a whole, and I really want to incorporate that into this blog. Thus, I am happy to announce the “new star attraction” for this blog coming summer 2015: Antediluvian Beasts of the East: New Looks at the Fossils of the Eastern United States. 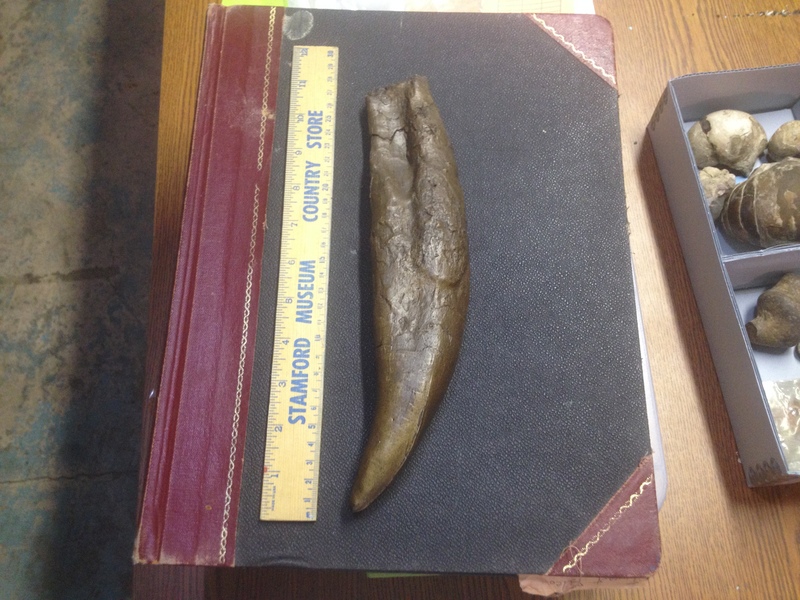 This series will highlight one prehistoric animal found in the eastern US per week. Ranging from the gigantic Miocene shark Carcharocles chubutensis to the tiny Late Cretaceous mammal Cimolodon, the Eastern US has a fascinating and underrated fossil record that deserves more attention. I am very excited to share these changes and new additions to this blog. These new series will start to show up right around mid-June. However, the spring-summer transition is a work-heavy time, which may affect my ability to blog. I will (hopefully) publish something on Friday. Thanks for reading! Giganotosaurus looks to the future! Gosh. I planned on doing the Dinosaur themed article last week, and then papers on two new dinosaurs (1 is avian) were published. A new Early Cretaceous bird has been described. Archaeornithura meemannae is an early member of Ornithuromorpha, the clade from which all modern birds stem. Two partial specimens of this animal have been collected from the Huajiying Formation in northeastern China. These animals are the first ornithuromorphs from the formation, and also predate the earliest known ornithuromorphs (from the famous Jehol Biota) by 6 million years. The fossil specimens suggest that skilled flight and rapid developmental growth arose in the early stage of bird evolution. The bird itself also had an awesome crest of feathers on its head. Meet Saurornitholestes sullivani. This new dromaeosaurid has been making headlines due to the large size of surface of its skull where the olfactory bulbs would have been located in life, suggesting the dinosaur possessed a good sense of smell. It was a relatively small dinosaur, being around 6 feet in length. The animal was excavated from New Mexico in 1999. This animal adds to the growing list of North American dromaeosaurids. At The Bite Stuff , Jaime Headden discusses the diet of Chilesaurus. You can find that post here. 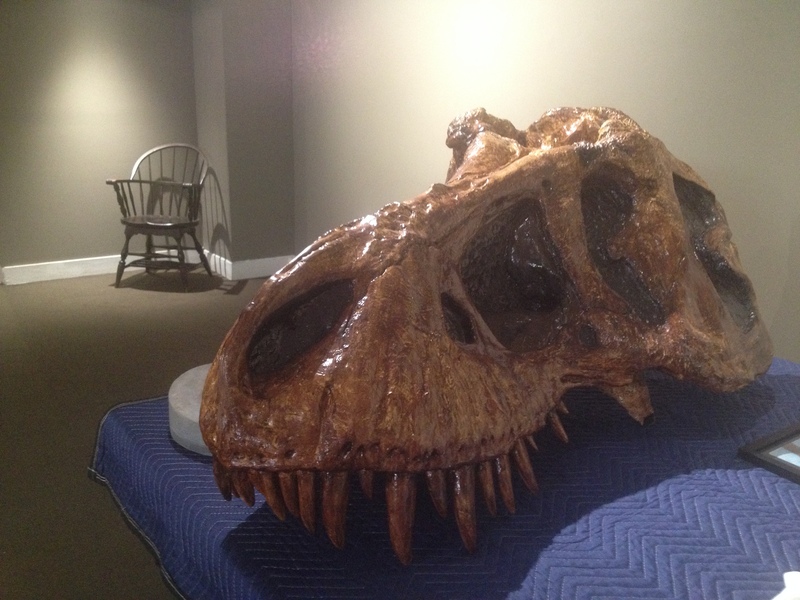 At dinosaurpalaeo, Mr. Mallison has reached the 10th installment in his Photogrammetry series. You can check the post out here. At his blog, Mark Witton discusses European wukongopterid pterosaurs (link here). LITC reviews a new Vintage Dinosaur Book here, and Darren Naish writes on domesticated african horses. PBOTW showcases the crested hadrosaur Parasaurolophus here. This week we have my illustration of a lone Merycoidodon for one of my museum’s exhibitions. It wasn’t used in the final exhibit but it was a blast to illustrate the animal! Merycoidodon by the author. Colored pencils on paper, 2014. Remember, if you’d like to feature your artwork, leave a comment saying so below. If you have paleoart and want to feature it, this is the place to do so! Anyways, I hope you enjoyed PaleoNews #12, and thanks for reading!! Hello all! Welcome to Terrific Tetanurae! #8. Enjoy! Today we take a look at one of the smallest non-avian dinosaurs. Enter the “Ashdown maniraptoran.” In 2011, Darren Naish and Steve Sweetman published a paper describing a single, tiny vertebra from an adult theropod. This specimen was collected from the Lower Cretaceous Wealden Supergroup in England. Because the dinosaur is only known from a single bone, it’s hard to definitively place this animal in any family of theropod dinosaurs, but we can be pretty certain it is some sort of maniraptoran based on the morphology of the vertebra. The vertebra itself is a tiny cervical. I mean a really tiny one. And because there is no neurocentral suture perceivable, we can surmise that the animal was full grown. Besides the initial description and Darren Naish’s blog post on the animal, there really hasn’t been much discussion of this guy. Contrary to popular thought, I don’t believe the vertebra came from a protoarchaeopterygid (although I should note that even those who have supposed this animal to be a protoarchaeopterygid have considered their hypotheses highly speculative). Rather, I think it may be a more derived oviraptorosaur. Indeed, the X-shape of the vertebra in dorsal view, as noted by Darren Naish, is also found in a variety of oviraptorosaurs, namely Microvenator. The “Ashdown maniraptoran” vertebra also seems more mediolaterally compressed then that of oviraptorosaurs like Microvenator. However, mediolateral compression is found in the vertebra of some derived oviraptorosaurs, namely Nomingia. I hope you enjoyed Terrific Tetanurae! #8, and thanks for reading! 1. Naish, D. & Sweetman, S. C. 2011. “A tiny maniraptoran dinosaur in the Lower Cretaceous Hastings Group: evidence from a new vertebrate-bearing locality in south-east England.” Cretaceous Research 32(4):464-471. 2. Makovicky, P. J. & Sues, H. D. 1998. “Anatomy and phylogenetic relationships of the theropod dinosaur Microvenator celer from the Lower Cretaceous of Montana.” American Museum Novitates 3240:1-27. 3. Barsbold R., Osmólska, H., Watabe M., Currie, P. J. & Tsogtbaatar K. .2000. “New oviraptorosaur (Dinosauria, Theropoda) from Mongolia: The first dinosaur with a pygostyle.” Acta Palaeontologica Polonica 45(2):97–106.